NEW YORK (CNNMoney) -- In the wake of a giant brouhaha over the news that Apple's iPhones record and store users' locations, Verizon Wireless says it will start slapping 'we can track you!' warning stickers on its products. Verizon's announcement came in the form of a letter to Representatives Ed Markey, a Democrat from Massachusetts, and Joe Barton, a Texas Republican. In March, they asked the four major wireless carriers to explain how and why they track mobile location data. 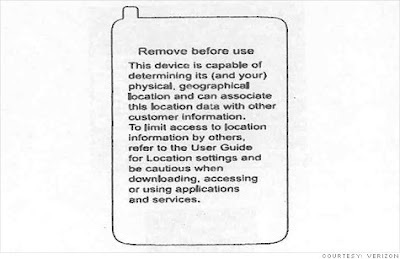 All four carriers acknowledged that they store location data for varying periods of time, but Verizon (VZ, Fortune 500) was the only company to suggest a warning label. The company says it will begin including the removable sticker on all new devices it sells. The sticker warns: "This device is capable of determining its (and your) physical, geographical location and can associate this location data with other customer information. To limit access to location information by others, refer to the User Guide for Location settings and be cautious when downloading, accessing or using applications and services." Verizon also disclosed that it stores location data and other customer information for seven years. Sprint (S, Fortune 500) keeps the details for three years, while AT&T (T, Fortune 500) retains it for anywhere from a few days to five years. T-Mobile did not give a timeframe. The carriers' responses came earlier in the month, but Congress first released them Thursday. Each of the letters pointed to third-party applications as the real culprit. Verizon said location-based apps "should give customers clear and transparent notice," while Sprint complained that it could no longer act as consumers' "trusted carrier with whom they have a trusted relationship to answer all of their questions." Markey was unimpressed. In a statement on his site, he said the carriers' responses left him "with a feeling of uneasiness and uncertainty ... the disconnect is when third-party applications come in to play." Meanwhile, Apple (AAPL, Fortune 500) has been cleaning up the PR mess made after two British researchers released an open source application that let Apple's customers see the location data stored on their iPhones and 3G iPads.